Send in the clones! On second thought, maybe not. CAN IT READ MY MIND? Find out the answers to these and other burning questions in this funny, informative, and ingenious book from two bioengineering experts who show you how to survive—and thrive—in a new age of truly weird science. • bioenhancements: They’re not just for cyborgs anymore. • DNA sequencing and fingerprinting: What’s scarier than the government having your DNA on file? Try having it posted on the Internet. • human cloning: Just like you, only stronger, smarter, and more attractive. In other words: more dangerous. Our future may be populated by designer babies, genetically enhanced supersoldiers, and one (or more!) of your genetic duplicates, but all is not lost. 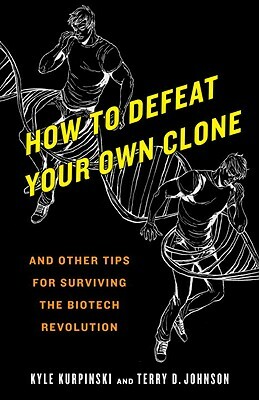 How to Defeat Your Own Clone is the ultimate survival guide to what lies ahead. Just remember the first rule of engagement: Don’t ever let your clone read this book! Kyle Kurpinski received a Master's degree in biomedical engineering from the University of Michigan and a Ph.D. in bioengineering in the joint graduate group between the University of California, Berkeley and the University of California, San Francisco. He is the lead product development engineer at Nanonerve, Inc.
Terry D. Johnson received his Master's in Chemical Engineering from MIT and is currently a lecturer in the Bioengineering Department at the University of California, Berkeley. "It's a hoot!" –Robert Zubrin, author of How to Live on Mars.